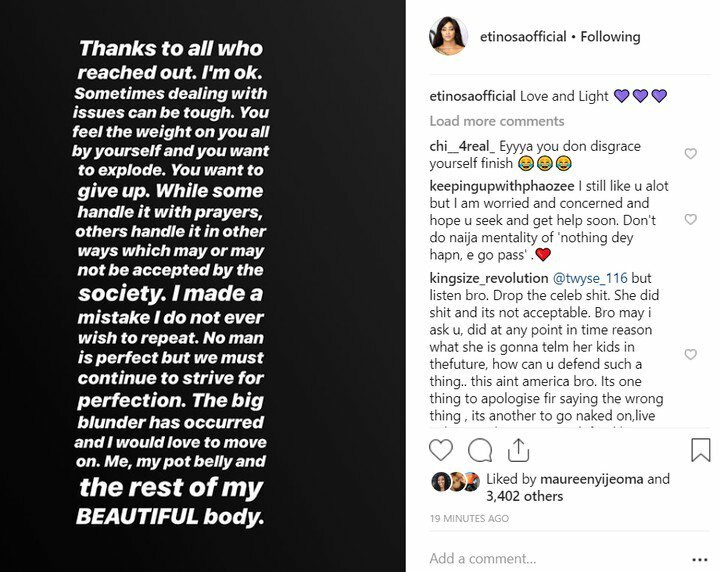 Nigerian actress, Etinosa has opened up on her action of removing her pants and bras on singer, MC Galaxy’s live Instagram video. The actress/comedian said a big issue weighed her down which she could not handle in a more appropriate way. However, in an Instagram post on Saturday night, she wrote, “Thanks to all that reached out. I’m okay. Sometimes handling issues can be tough. “You feel the weight on you all by yourself and you want to explode. You want to give up. While some handle it with prayers, others handle it in other ways which may not acceptable to society. “I made a mistake I do not ever want to repeat. No man is perfect but we must continue to strive for perfection.